A blog where one woman is on a mission to make the world cuter, one kid, cupcake or crafty thing at a time. Hello my cute cute friends! I know I am posting this a bit early...but I want to get a head start on this week! I am giving each and every one of you cute people a $20 gift code to eShakti! and you will get $20 off your order! I already have two of their dresses made custom to fit me, and I ADORE them! This is the dress I am thinking for fall-won't this be cute with some tall boots? I need a double strand of pearls...and hey these will go so cute with the dress above don't you think? Oh and it's only $14.95-I add this to my shopping cart and it's FREE with my $20 code, with $5 to spare! Yes please! It is going in my shopping cart now...and they have it in different colors...and I can customize the length so it fits just right. Yay! If you want to see what else I have added to my wish list head over to my eShakti Wish List Pinterest board HERE. Then head over and pick out your favorite item, have it sized just the way you want and be sure to enter in the code to get your $20 off their already awesome prices! If you don't need (ha!) any new clothes or jewelry and know someone else who does...let them know about this and be sure to give them the code CUTERWORLD0811. Note: The discount code is not case sensitive. Valid till 15th September, 2011. Only one gift certificate can be used per order. The code can be used any number of times until the validity period. This discount code is not applicable on the Overstock category. This cannot be clubbed with any other offer / discount that may be active during this period. Now that we know where we will be buying OUR back to school clothing...let's see what cute projects you liked from last week! 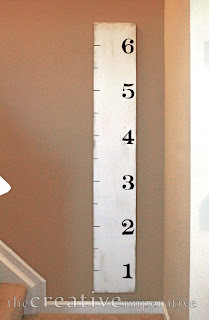 Last week, the project with the most likes was this GORGEOUS growth chart by Jamie at The Creative Imperative. Looks like something right out of a Pottery Barn catalog doesn't it? And then the most clicks on a project was this lovely bracelet (and she has several others to drool over) at the Creative Passage by Ellen. I want all of them. SO cute! Now it's time to see what you've been up to this week! You must link back to me (http://makingtheworldcuter.com) Some of you are getting some good traffic from this party, about an average of 15-20 hits each, some hitting the high 40's and 50's! I love helping out like this...so scratch my back a little too, okay? :) EDIT: MY BUTTON WAS LINKED TO MY BLOGSPOT ADDRESS NOT MY .COM ADDRESS, IT IS FIXED NOW, BUT IF YOU ARE HAVING PROBLEMS WITH THE BUTTON, YOU MIGHT NEED TO RE-INSTALL IT, OR JUST TEXT LINK TO MY .COM ADDRESS. SORRY ABOUT THE CONFUSION! Look around and give some of those links some likes...practice good juju! You like others, others may like you. Thanks for making the world so stinkin cute! I am just a crafting, cooking, homeschooling, picture taking, web designing, wife to a McDreamy lookalike, crazy mom of 4... Making the world cuter.